On the day the Royal Bank of Scotland reported the biggest annual loss in UK corporate history – a mind-boggling £24 billion – and news emerged of former chief executive Sir Fred Goodwin’s £700,000 a year pension, New Labour announced its third rescue package for the stricken bank. This was timed to prevent a further decline in the bank’s share price which had fallen by 90% in the last year. The plan worked. Shares rose. How so? The deal stops short of total state ownership, limiting the state’s interest in the bank to a potential 95%. But the government’s, and hence the taxpayers’ non-voting share-holding leaves control and any future profits to the current shareholders. The details of the deal are complex, involving a tax-funded insurance scheme under which the state guarantees to buy up the bank’s toxic assets. Since October, the major capitalist countries have pledged not to allow systemically important banks to fail. What is being protected by this conspiracy of the world’s most important governments is of course the system of social relationships in which private capital owned by shareholders underpins billions of employment contracts. The contract guarantees that part of the value generated by the labour of people who work for a living ends up as profit in the shareholders’ bank accounts. But the economy is in freefall, and the profit system is broken. Japan’s exports have fallen by 50% in a few months and its industrial output plunged 10% in January - the biggest monthly drop since records began more than half a century ago, the government said today. Key industries like car manufacturing which have been the engine of growth are, like the banks, bankrupt, too important to be allowed to fail, too big to save. This contradiction is real. It can be resolved in one of two ways. The competitive logic of capital insists on the destruction of overcapacity and the loss to humanity of much that it has produced. The 90% drop in RBS’s share value provides a measure of the shrinkage the system needs before growth can restart. Another way is possible. A different kind of government and political system would greatly simplify the rescue by taking the banks – all of them – into full social ownership. Has anyone trodden this path in history? Well, yes actually. Just a few weeks before the Russian Revolution of 1917, Lenin wrote how capitalism had made a new society possible by creating an “accounting apparatus in the shape of the banks”, which revolutionaries “take ready-made from capitalism; our task here is merely to lop off what capitalistically mutilates”. He added: “ We can ‘lay hold of’ and ‘set in motion’ this ‘state apparatus’ ...because the actual work of book-keeping, control, registering, accounting and counting is performed by employees, the majority of whom themselves lead a proletarian or semi-proletarian existence.” [emphasis in original]. A few weeks later the transfer of Russia’s private banks into public ownership was achieved. RBS has vast resources and assets worth a nominal £2.2 trillion. It has been at the heart of the world’s financial system since the earliest days of capitalist production. It grew to become one of the world's top 10 financial services groups which operate in every country around the world. The services they provide over global networks enable people and organisations throughout the world to account for the products they produce and exchange. In common with most of the big banks, RBS provides insurance services. It is the second largest general insurer in the UK, and the biggest provider of motor insurance. It develops and maintains the infrastructure and technology that support its branches and cash machines, internet and telephone banking services, mortgage processing and money transmission. The work of the bank is carried out by the more than 140,000 people it employs worldwide. Under their control the bank can continue without the need for shareholders. From their own ranks they could elect a new system of democratically-accountable management. Who needs the owners or executives like Goodwin? No one! It's time to seize what belongs to us in any case. 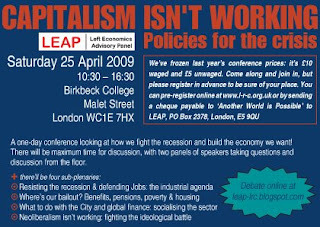 LEAP will be hosting its second conference 'Capitalism Isn't Working' at Birkbeck College, Malet Street, London on Saturday 25th April 2009 - just three days after the Budget. Speakers and contributors include: John Christensen (Tax Justice Network), Penny Cole, Bob Crow (RMT), Andrew Fisher, Paul Feldman, Professor Gregor Gall, Gerry Gold, Rahila Gupta (Southall Black Sisters), Colin Hampton (UWC), John Hilary (War on Want), Jerry Jones, John McDonnell MP, Cllr Gordon Nardell, Rosamund Stock, Graham Turner, Professor Richard Wilkinson, Matt Wrack (FBU). Download the full conference agenda. It's a one-day conference from 10:30am to 4:30pm looking at how we fight the recession and build the economy we want! Register online for the conference. We've frozen last year's conference prices: it's £10 waged and £5 unwaged. Come along and join in, but please register in advance to be sure of your place. You can also pre-register by sending a cheque payable to ‘Another World is Possible’ to LEAP, PO Box 2378, London, E5 9QU. LEAP has published research for the RMT union showing the devastating effect that the recession could have on the UK rail network. View the RMT press release here. "The difference is that this time we have private operators that have already squeezed tens of millions of pounds out of the railways straining at the leash to cut services and staff, and to renegotiate their franchise agreements. "If we are to see the railways play their full potential role in the economy and for the environment it is crucial that the government does not allow any more attacks on rail services and jobs solely to satisfy the short-term selfish interests of shareholders. "The study we commissioned suggests that passenger numbers will fall, perhaps for as long as three years after the recession bottoms out, and it should be unthinkable to allow the resulting fall in revenue to be paid for in cuts in jobs and services or even higher fares. "If franchises cannot or will not deliver the services they are contracted to within the terms of their agreements they should be allowed to hand back the keys and the services operated in the public sector." Download the LEAP research for free. The chart below shows rail passenger use (the pink line) against UK economic growth (the blue line). National Express Group is seeking to cut 750 jobs across its East Anglia and East Coast franchises. At least 800 jobs at risk as a result of Network Rail deferring 28 percent of rail renewals, such as laying new track, installing new signals – a decision not related directly to the recession. The UK's main railfreight operator DB Schenker (formally EWS) has announced over 500 jobs losses and that further significant numbers are at risk as a result of Network Rail's deferral of renewals. South West Trains has announced plans to cut at least 660 jobs, including ticket-office and platform staff, despite the partial rejection by the Department for Transport of its plans to reduce ticket-office opening times. Thu Update: Passenger Focus has today published a report showing that UK rail fares are the highest in Europe. In June 2007, just as he became Prime Minister, Brown said in his Mansion House speech that we were witnessing "the beginning of a new golden age for the City of London." You may think that the collapse of many high street and investment banks would have shaken Brown's faith in free markets, but at the Lord Mayor's Banquet in November last year he said, "I want this to become the moment when together we rise to the new challenges by purposeful visionary and international leadership . . . not as the victims of history but as shapers of an open, free trade, flexible globalisation." I quoted this head-in-the-sand 'neoliberalism or bust' attitude (it's gone bust, Gordon!) when I addressed a meeting organised by The Commune last night. This morning, there's an excellent article by Graham Turner in The Guardian cataloguing the effect of neoliberalism throughout the globe. Graham makes the sound point that "A new world economic order requires protectionism - for workers". Meanwhile, Richard Murphy reports on his blog that word has reached him from the G7 that Brown has blocked reforms to to create transparency, enhance regulation, and crack open the tax havens. 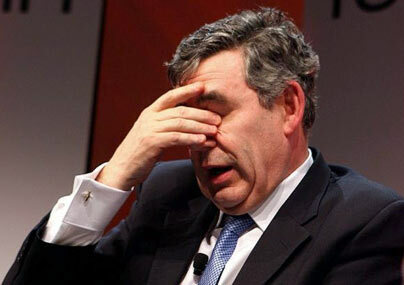 What must life be like in the Gordon Brown bunker? Yesterday around 200 PCS members working for HM Revenue & Customs around the country descended on Parliament to lobby MPs. The lobby and rally are part of the union's HOOT (Hands off our tax offices) campaign and comes in response to a programme of office closures and job cuts by HMRC, which will see over 200 offices closed across the UK and 25,000 jobs cut by 2011. Given the massive Tax Gap, which people like the Tax Justice Network have been highlighting for years and which the Guardian has been focusing on for the past two weeks, it is nonsensical that the Government is laying off people who collect taxes. Even the most conservative estimates show there is £21.5 billion worth of uncollected tax and £25 billion lost through tax evasion which could be ploughed into public services and stimulating the economy. Also at a time of recession, and when the Government says it will create jobs, why is it sacking 25,000 people - just because, as John McDonnell MP pointed out at yesterday's rally, Gordon Brown got into a Dutch auction with the Tories about how many civil service jobs he could cut? Yet again in this recession the Government, wedded to its neoliberal ideology, is taking precisely the wrong action - and will exacerbate the crisis. Unemployment rose again today, with the claimant count hitting 1.23m and the ILO measure reaching 1.97m by the end of last year. "These figures are horrendous for the mounting numbers of people on the dole. Yet they hide the large numbers of workers now on short-time working and enforced sabbaticals. There is also a growing issue of in-work poverty. "The situation is not helped by the privatisation of Jobcentre services, which drain resources from tackling unemployment - diverting it into the profits of private companies. "The Government must now halt the privatisation of welfare services, and we will be demanding that at the mass lobby of Parliament on 3rd March which is supported by PCS, the TUC, and dozens of welfare organisations." The Public and Commercial Services Union, the union representing Jobcentre Plus staff, praised their professionalism and hard work in dealing with the rising numbers of unemployed as figures out today showed a continued rise in those out of work. Warning that the system was creaking under the pressure and was only being held together by the hard work and commitment of Jobcentre staff, the union urged the government to put more resources in Jobcentres and to re-open offices. Jobcentres have extended their opening times and staff are working overtime to provide support and advice to people finding themselves out of work. With jobcentres under severe strain, the union warned that taking Jobcentre staffing levels back to 2005 levels wouldn't be enough. Between 2004 and 2007 the government cut 18,000 Jobcentre staff and have closed over 500 jobcentres and benefit offices in the last 5 years. As the recession deepens, PCS also criticised the government's Welfare Reform Bill, arguing that jobs not punitive sanctions were needed, warning that the bill would drive people into poverty and stigmatise those who needed the most help. "Jobcentres are creaking under the pressure of the rising numbers of unemployed. If it wasn't for the dedication and hard work of Jobcentre staff then people wouldn't be getting the first class help and support that they expect. In stark contrast to the obscene bonuses in City, low paid jobcentre workers, many of whom received no pay rise at all last year, are helping people whose lives have been turned upside down by the economic crisis. "The government need to get ahead of the game by putting more staff into jobcentres and by re-opening offices to ensure the growing numbers of unemployed get the help and support they need. The government also needs to drop its obsession with privatising Jobcentre work and step back from writing blank cheques to private companies who are demanding more money for contracts to help the long term unemployed into work." LEAP is supporting the PCS lobby of Parliament on the Welfare Reform Bill, which takes place on Tuesday 3rd March. Get along and lobby your MP. Who pays for the economic crisis? The Prime Minister needs to realise that for the general public the Government's treatment of bankers' bonuses is the key test of who will pay for the economic crisis they have caused. Allowing bonuses to be paid to the higher paid bankers who caused this crisis by their greed and recklessness will be seen as fundamentally unfair. Fumbling around with nothing more than ineffective warnings of inquiries is pointless. The Prime Minister needs to get a grip and take the decisive action needed to end the bonus culture and send a clear message that the binge banking party is over. 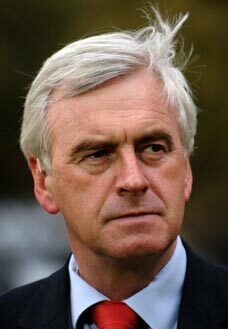 *John McDonnell MP has tabled EDM 353 'Banking Sector and City Bonuses' in the House of Commons. It calls for "the banking industry to be fully nationalised under public control so that finance is provided in the national interest." 5pm update: See Richard Murphy's take on Brown's hot air too. I spoke at the opening session of the Communist Party's Capitalism in Crisis political school earlier today on 'Trends in the British Economy and Employment'. The other speaker, economist Frank Wilkinson was unable to attend as he was snowed in, and so CPB General Secretary Rob Griffiths spoke alongside me - giving a very coherent and theoretical analysis of the crisis. The debate that followed was passionate, articulate and wide-ranging - exactly what the Left needs to be in the coming period if we are to make an impact in this crisis. And if we don't, others like the BNP will. However, we should be confident, bold and unintimidated in taking the fight to the Government and corporate interests. It is they who have led us into this crisis and they who are currently doing everything to ensure it is a deep recession. The Government remains hopelessly misguided and wedded to its outdated neoliberal ideology. The banks have not been nationalised in any real sense. The meeting variously described it as 'the privatisation of public money' and 'light-touch nationalisation'. The power workers' wildcat strikes were also discussed - emphasising the need to protect jobs, pay, and terms and conditions in the current period. Protectionism was also debated. As Rob Griffiths pointed out, what else is the labour movement for if not to protect jobs and protect wages. There is nothing progressive about the right of transnational companies to freely move capital, labour, and resources around the globe. At the same time we have to argue for the greatest international solidarity and to challenge those reactionary forces who want to turn this debate about class into one about race or nationality. Another issue that generated alot of outrage is the Government's current attack on welfare, which at a time when unemployment is over two million and there are only 200,000 vacancies in the economy is a cruel attack on some the least powerful and most vulnerable in our society. The trade union movement has been shameful at times in defending welfare rights. Unemployment benefit is worth a fraction of what it was thirty years ago, lone parent benefit entitlement is being attacked and those with children as young as three will be compelled to undertake 'work-related activity' just to keep their existing benefits. The long-term unemployed will be put on workfare programmes - full-time work just for their benefit - that's £1.73 per hour. We are on our way back to the workhouse. It's about time that all unions started fighting on behalf of working people - at least another million of whom will become non-working people this year and be subjected to this degrading regime . . . unless we stop it. There is a Lobby of Parliament, organised by PCS, on Tuesday 3rd March. Get to Parliament and tell your MP to vote against the Bill. This is about who pays for the crisis. Let's see the Government instead attacking the city spivs and speculators and the tax avoiding companies with the same verve. Large numbers of workers taking spontaneous direct action have not only shocked this New Labour Government but have also disoriented some sections of the Left. I have been off the scene largely because of the 3rd Runway announcement two weeks ago. When the Government announces that 10,000 members of your community are about to lose their homes and you are their MP you have a responsibility to focus your attention on their deep felt cares and concerns. So in the last couple of weeks I have thrown myself into organising meeting after meeting in my constituency, speaking to over 1500 people and contacting by various means nearly 20,000. Their response has been feelings of fear, insecurity, anxiety, anger and sheer determination to fight back. It is these same feelings of insecurity, turning to anger and determination to resist that has motivated the workers involved in the strikes at the energy companies around the country. No worker can feel safe in their jobs as the recession slips into a depression. People are inevitably fearful for their futures. They also have no confidence in the existing political structures and process being able or willing to do anything to protect them. The party that they voted into power has turned out to be the very Government that has promoted the privatisation, contracting out, outsourcing, and off-shoring, which have stripped away their basic protections at work, undermined their employment security, intensified their exploitation, cut their wages and forced them into debt dependency. People have also learnt that working through the official structures of their trade union has been rendered largely ineffective by the persistence of Thatcher’s anti trade union laws under this Government. Increasingly they have also come t know that they cannot rely upon many of their trade union leaderships who have delivered up their unions in support of New Labour and who less than 2 years ago installed Brown as Labour leader, the evangelist for globalisation, free markets and flexible labour. Without political representation and with limited potential to mobilise through official union channels there is no other route but to take but direct action when fear for jobs turns to anger. Every member of the Labour and trade union movement should welcome the energy workers getting off their knees, standing up and fighting back. It's called solidarity. In any dispute or struggle this doesn’t mean blindly accepting either the analysis or demands of those directly engaged in the dispute. It certainly doesn’t mean accepting without question the media’s representation of their demands. Disputes are at times chaotic with goals sometimes ill defined and often quickly evolving. This latest round of disputes, like many more to come, has been about the right to work. As this latest crisis of capitalism unfolds many more workers will be demanding the right to work and we must support them. If we are provide effective support we can learn from some of the lessons of this dispute so far. First, as the Government has refused to abolish the anti trade union laws the lesson is that if workers are sufficiently determined they can just ignore them. Using unofficial structures has been successful in mobilising this time but by their nature they are difficult to maintain. If the TUC and the general secretaries of major unions showed the same determination and solidarity of the workers in this dispute and stood together to challenge the legal restrictions on trade union rights in Britain we could destroy them once and for all. Future disputes should be made official to bring this issue to a head. Second, if cheap labour is being used by employers to undermine wages and conditions, its country of origin is irrelevant. Similarly, "British jobs for British workers" was designed to divide us to compete for increasingly scarce jobs, forcing down wages and eroding job security. Just as many of the stewards in this dispute have made clear, we should never allow the bosses or the media to divide us on grounds of nationality or race. Our demand is the right to work for all. Third, because the EU legislation and court rulings associated with the open market are being used to divide worker from worker the onus is upon us to build urgently the links of solidarity with European unions to enable joint action to protect jobs, wages and conditions. Where the TUC has failed the newly formed TUCG of radical unions could succeed by launching a series of talks and measures to construct these international alliances. Fourth, as the depression forces more workers onto the dole queue industrial action alone will not be enough to protect jobs and living standards. The question of who will pay for this crisis will be determined by the answer to the question who controls our economy. The battle for control of our economy needs to be fought out politically as well as industrially, and nationally as well as at the level of the firm and industrial sector. Our demand is for a national economic strategy aimed at protecting and creating jobs, investing in public services, ending privatisation and promoting public ownership, tackling poverty and inequality and creating a sustainable environment. The launch of the People's Charter campaign presents us with an opportunity to mobilise for this change. Fifth, the depression is likely to present the Left with ever new situations and challenge us to respond swiftly and effectively. Very quickly we need to decide the best mechanisms for the faster flow of information and for the co-ordination of solidarity action. The TUCG, the LRC, the Convention of the Left, union broad lefts and the emerging People's Charter network of activists, all have a critical role to play. Putting this together quickly over the coming period will be a central task for us all. The angry walk-outs by engineers and construction workers at refineries and power plants around Britain in defence of their livelihoods is the first major - and explosive - reaction to the economic crisis in the UK. That said, the form these strikes has taken urgently needs redirecting. They cannot be endorsed so long as they are aimed principally against foreign workers. When strikers have the enthusiastic backing of the far-right British National Party because their main demand is “British Jobs for British Workers”, it is necessary to ask: What is going on here? When a few hundred Italian workers are too scared to show themselves in public, you have to say that this is shocking and unacceptable. The contradiction between the essence of this struggle and the form it has assumed is not surprising. 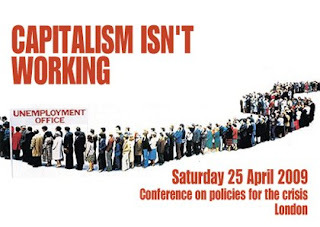 Getting right to the heart of the matter - the emerging capitalist slump and the crisis of governments as unemployment accelerates - demands a united, revolutionary stance against the joint rule of global corporations like Total and client regimes like New Labour. Then, and only then, can we begin to find solutions to the immediate and pressing question of unemployment affecting workers who were passed over for jobs at Lindsey when the French-based global corporation Total awarded a contract to an Italian firm (which itself is sub-contracted by an American company) which brought its own workforce along. If there were jobs available locally, then no one would be on strike. But how can employment, new jobs, be generated? That question won’t be answered by driving a few Italians home and lining up authentic “British” workers to take their place. If workers from Europe or elsewhere should not take “British” jobs does that mean that British workers in other countries should be driven home in similar fashion? Brown, who took up the BNP’s “British Jobs for British Workers” policy, says there are no ready solutions to the global capitalist crisis to hand and no lessons to be learned from history. In that case, he and his wretched government should go now because it is of no use to man or beast. Ministers like Lord Mandelson, with his contemptuous remark that workers should get on their bikes and look for work elsewhere in Europe, are deservedly hated by the strikers. Trade union “leaders” like Derek Simpson, who have done nothing to defend jobs during the recession and who now encourage nationalism amongst their members for the most opportunist of reasons, should also be got shot of. Simpson, on £200,000 a year plus a luxury house for life, free, is standing for re-election and is cynically using the dispute to help his campaign. The issues involved in the walk-outs are all aspects of corporate-driven globalisation: contracting out, sub-contracting, flexible labour, a European Union run by and for the corporations and a trade union movement which has halved in membership and now largely led by donkeys whose respect for Tory/New Labour anti-union laws remains unbroken. Dividing workers along national lines, as the Unite bureaucrats are happy to do, plays into the hands of the global corporations and the political parties that service them. Defending the action on the grounds that workers are the victims of globalisation, is simply kow-towing to backwardness, instead of raising the level of their struggle. Like it or not, there is a new internationalisation of labour. The point is to turn it against the employers, not go backwards to insularity and localism. Workers in Iceland, Russia, Greece, Hungary, Latvia and France have demonstrated against their governments. In Ireland, workers at Waterford Crystal have occupied their plant, providing an inspiration to every worker by challenging the right of owners to decide their future. Now is the time to move against an unsustainable profit-based system based on exploitation of human and natural resources. The epochal character of the crisis means that the time for defensive actions is past. It's not an accident that this sudden eruption of anger takes place in the oil industry - control over the use of fossil fuels is at the heart of the global crisis. If workers are unhappy at the way Total divides up jobs and plays one group off against another, then let the plant be occupied and the management driven out. Bring Total under permanent workers’ control and management as a first step towards reorganising the corporation. Decisions about the production and distribution of oil can be on a sustainable not-for-profit basis. Bring down New Labour, the bosses’ government! The government is in secret talks with the army and the police and could spring an authoritarian national government on Britain as the crisis worsens. Don’t give them the chance. Replace Unite leaders with those committed to fighting New Labour. Start to build local Assemblies to represent all workers of whatever nationality and origin, and other sections of the community, as a step towards transferring political and economic power to working people. Launch a programme of publicly-financed building projects to create new homes, schools and other infrastructure so that work is available to all who need it. Fighting for policies along these lines would take the strikes in a different, outward looking direction and inspire millions to join them in the project to transform society to one which puts the interests of ALL workers first.